I’ve used Liquid Rhythm to achieve more variation within my beats in some of the songs and probably will continue to do so. 1) Describe your experience with Liquid Rhythm in one or two sentences. I love using Liquid Rhythm for creating broken beat variations. It’s great for adding all those little humanized hi-hats, breaks, and other drum fills that would otherwise require lots of editing. 2) Who are you, where are you from? Labels? Affiliations? I’m Madeleine Bloom, an electronic musician, producer, vocalist and multi-instrumentalist from Berlin, Germany. I release on my own label Quixotica Records. I’ve opened for Grammy winner Imogen Heap and my music has received praise from renowned producers like Guy Sigsworth and Rupert Hine. 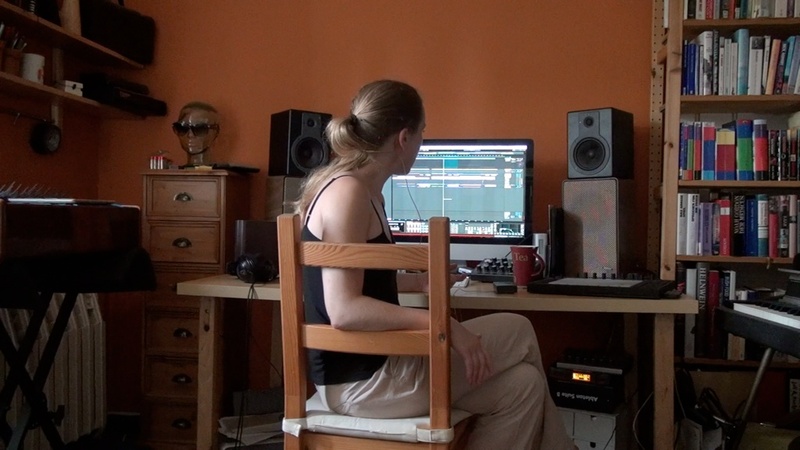 I’m part of female:pressure, a database and loose collective of female electronic artists. 3) What are your favourite genres of music to produce? Well, I’ve been told that my own music is genre-defying although you could call it electronica or leftfield pop. I don’t think in terms of genre when I’m working on music, but rather what story I want to tell and what emotions to convey. I’m not sure if this answers your question but there it is. 4) Which instruments do you play? The first instrument I learned was classical guitar which I started at the age of 6. As a teenager I added bass, drums, and keyboards while playing in bands. Piano lessons soon followed since I always wanted to learn to play the piano. I also play array mbira, vibraphone and an array of other instruments, not necessarily well though. 5) When did you first start producing music? I got started as a teenager. Back then I was just ping-pong recording on tapes with a bad mic to capture my ideas. We also did 4-track tape recordings with the different bands I was involved with. At university I then studied Media Design and Electroacoustic Music, had access to a sound lab with Samplitude and later also Pro Tools HD. That’s when I switched to DAWs. First PC, then both, now only Mac for a couple of years already. I’m still on 10.6.8 though. Ableton Live 9 and Logic 9. Mostly the former these days though.. Various analogue synths. My favourites are Moogs. Instruments include Rhodes Fifty Four, array mbira, vibraphone, Epiphone Les Paul Birdseye and more. Mostly Max for Live devices. 8) Describe your process for beginning a song; do you start with a drum rhythm or a melody? That really depends on what inspires me in that particular moment. It could be a beat, a melody I sing, chords or melodies I play on an instrument, a bass line on an analogue synth or an everyday sound I mangle. I don’t actually have one way of beginning a song because I don’t like routines much. I want to avoid doing the same thing over and over. Often I lay down some sort of skeleton, the bare bones of the idea in Ableton Live without worrying about the sound quality. Then later I flesh things out, add lots of details and variations and replace any MIDI instruments I’ve used with real instruments or build my own. 9) How do you use Liquid Rhythm when producing in the studio? Generally I record the basic beats on Ableton Push by simply drumming out the rhythm and copy or record them into the Arrangement View. Then if I want a song to have tricky, elaborate or broken beats (which is often the case) I use the Max for Live MIDI effect of Liquid Rhythm to add the details. I used to copy the beats over from the arrangement into the Session View to do this, but now that Liquid Rhythm works on clips in the Arrangement View of Live, I do it in place. 10) How did you get into creating music production instructional videos? I worked as an Ableton tech support for a couple of years and realised that I was good at explaining how things in music production are done and enjoyed it. As it is, my own music doesn’t quite pay the bills and in my work as a tech support I could see what users struggled with. So now I offer video courses for Ableton Live and Push on Sonic Bloom, as well as free video tutorials. I also offer one-to-one online lessons so that no matter where someone lives, if they get stuck with a problem to do with Ableton Live, music production or composition, I can help them via Skype. 11) Creatively speaking, what kind of advice would you give to someone who is just starting out and looking to get into making electronic music? Even though you don’t have to learn an instrument anymore to make music, I’d recommend to get some basic piano or keyboard lessons. You not only become faster in getting your ideas out of your head and into a DAW, but you also learn about music theory and composition. If you’re fine with using computers, read the manual and possibly take a course, you’ll be able to put together a decent enough track quite quickly in the DAW of your choice. Other than that, keep exploring new things, keep learning, have fun and don’t be afraid to make mistakes. 12) What projects are you currently involved with? Any involve Liquid Rhythm? The only project besides teaching as well as mixing and mastering that I have time for is my own music. I’m currently working on my next album. It’s about halfway done. And yes, I’ve used Liquid Rhythm to achieve more variation within my beats in some of the songs and probably will continue to do so. 13) What do you want to see in music production software in the future? I’m quite happy with my current options in regards to music production. Things are so much easier than, say, 10 years ago, and equipment has become cheaper. I do, however, have quite a few ideas about what I’m missing for my electronic live performances. I do live looping with both acoustic sources (voice, instruments) as well as MIDI instruments. A kind of modern one-woman-band. To recreate my songs live, I need to remember and do heaps of things at a specific time. I’d like things to be more intuitive, like playing an instrument. So far, it requires a lot of MIDI programming and workarounds to allow for a creative flow while going beyond knob twiddling and mixing. WaveDNA is a Toronto, Canada based music software development company founded in 2010. More than 15 years of music research have been applied to designing and building plugin instruments Liquid Rhythm and Liquid Music.